This sounds like a movie that I really want to watch. Click into that trailer below and see what I mean! I love to laugh--and this one seems to be one that will keep me and probably you and your children smiling and groaning and laughing straight through to the end. Of course if you just can't wait--you can click in to where it says purchase it now. Daddy's Home 2 is now available on digital and on Februaty 20 you can own your own copy! This is a hysterical movie that everyone will love! This kit has everything you need: the Blu-ray Combo Pack (with DVD and Digital copy), a Pop Pop popcorn container, a Daddy mug, popcorn, hot cocoa and a journal. 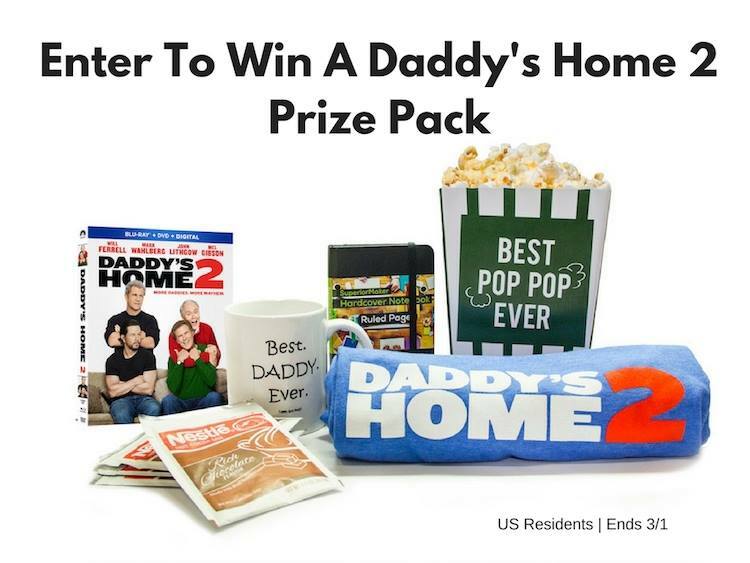 It’s more daddies and more problems in the uproarious family comedy DADDY’S HOME 2 coming home on 4K Ultra HD, Blu-ray and DVD February 20, 2018 from Paramount Home Media Distribution. The original Daddy’s Home also arrives February 20 on 4K Ultra HD Blu-ray and both films will be available in a two-movie Blu-ray Double Feature pack. Giveaway Details: Open to US Residents. 1 Winner. Giveaway Ends 3/1/18 at 1159pm EST. Good Luck! Blogger is not responsible for the prize. Will Ferrell is my favorite actor! Of course Will Ferrell as Brad..
My favorite character is Brad (Will Ferrell). I would have to say Will Ferrell. He's so funny in his movies. Will Ferrell is my favorite!! Will Farrell as Brad, so funny!! Will Ferrell is my favorite character. I just love him. I like Brad the most! Dusty is my favorite character. Will Ferrell's character is my favorite. Brad, most definitely is my favorite character!